Well, I’m glad we cleared that up. Now that we understand subtext, we’ll be sure to layer it into our work effectively and wow literary critics the world over. The problem with seeking to define literary terms created by literary types is that they use literary notions to explain them. It all comes off as sounding very … literary. I mean…Conversational Implicature? Subtext is all the things that aren’t being said that connect the reader to the story. It’s all the things in a scene that the characters aren’t saying, but the reader still picks up on. It’s the elements that evoke a feeling in the reader and lay the foundation for the action to come. It’s the connections that a reader makes to the story by bringing their experience, their attention, and their perceptiveness into play. 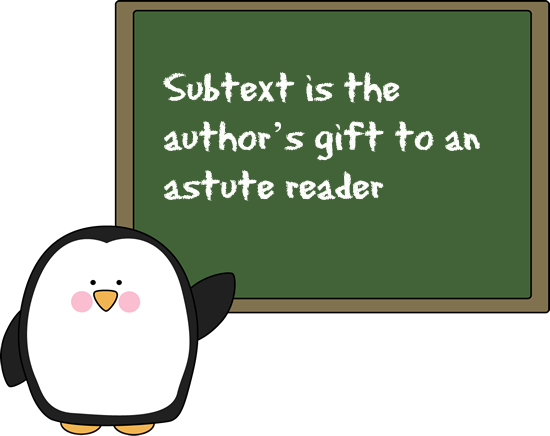 Subtext is the author’s gift to an astute reader. Have you ever read a story that grabbed you, pulled you in, had you asking story question after story question, remembering details, fitting the pieces together, trying to anticipate what might happen next and being thrilled when you were right and equally thrilled when the author plausibly surprised you? That’s subtext. It engages your emotions and mind and draws you into the story as an experience, not an exercise. Isn't that what we want in a story? Isn't that what we want for readers when they read our stories? So, how can we effectively employ subtext? First, we must recognize the two basic types of subtext. This covers things like theme and setting. Things present throughout the entire story. If your story is about redemption, you might have subtext layers like the renewal of springtime, or a rescue puppy, or a pawn shop item as a plot device. If your theme is about the veneer of society that hides a darker underbelly, you might set your story in a suburban neighborhood, or a Regency ballroom or a finishing school. Juxtaposing the setting with the plot is a great subtext tool. MACRO subtext is often revealed when the reader is finished with the book and reflects upon it later. It’s what makes a book linger in the mind afterwards. This covers things that happen within scenes. Characters that say one thing and mean another. Characters that withhold information from one another, but the reader knows it. A line that a character says that the reader wonders if it will come back to haunt that character. A piece of the story puzzle that seems out of place and the reader has to try to fit it in. 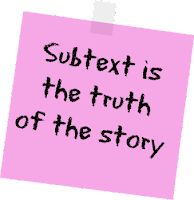 MICRO subtext is what happens while the story is being read, and it’s what keeps the reader engaged in the story. One of the reasons mysteries are so popular is that subtext abounds. Detective stories are built on subtext. Who is lying, who is manipulating, and who is guilty? Everything must be evaluated, every clue, every gesture, every word. Deductions are made by the reader, engaging the readers mind and emotions. Subtext also overflows in romance. Sexual tension and attraction are often, especially at first, and especially in Christian Fiction, delivered as subtext. That first, gradual awakening of feelings, the realization by the reader that there’s something going on there, whether one or both of the characters is aware of it. Subtext is often what one character and the reader knows, but none of the other characters know. It’s privileged information. And who doesn’t want to be in on a secret? If you want to study up on the use of subtext, I’m going to recommend you read “The Crocodile on the Sandbank” by Elizabeth Peters. Peters was a MASTER at subtext, plot, and characterization, and by the end of the story, your grasp of all three will be better! Subtext is the truth of the story, every character is trying to conceal or reveal it, and the reader is actively involved in sorting out who is who and who knows what. Subtext springs from the fact that you realize both your reader and your characters have inner lives, and that during the reading of a story, those inner lives intersect. 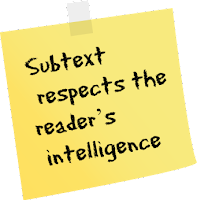 Subtext respects the reader’s intelligence, gives them more than just what’s on the surface, and actively engages both what they know and what they want to know from your story. Best-selling, award-winning author Erica Vetsch loves Jesus, history, romance, and sports. She’s a transplanted Kansan now living in Minnesota, and she married her total opposite and soul mate! When she’s not writing fiction, she’s planning her next trip to a history museum and cheering on her Kansas Jayhawks and New Zealand All Blacks. 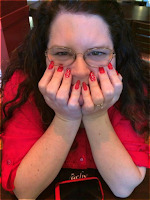 You can connect with her at her website, www.ericavetsch.com where you can read about her books and sign up for her newsletter, and you can find her online at https://www.facebook.com/EricaVetschAuthor/ where she spends way too much time! 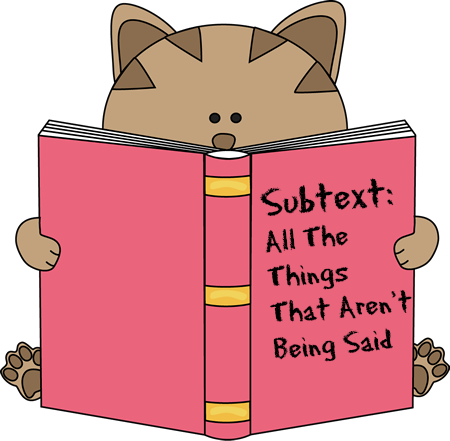 I think subtext is simply a second meaning for what is on the page. The story text still makes sense without the subtext but it is not as rich. "Did you know that Tina saved "Paradise" by Indy publishing book six, "Back in the Cowboy's Arms", herself?". "Yes and that's good because one "Paradise Lost" is sufficient". Hey, Vince, I agree. 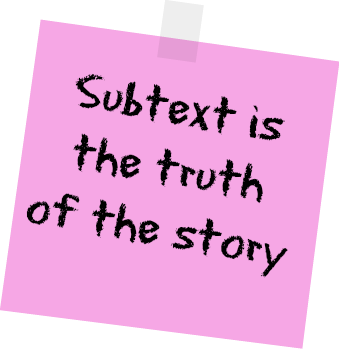 Subtext is what adds the richness and depth to the story, because it's what engages our emotions and draws us in. Vince, would you agree that double-meaning is one form of subtext? The Conversational Implicature mentioned above? Or is that the entirety of subtext to you? "Vince, would you agree that double-meaning is one form of subtext? The Conversational Implicature mentioned above? Or is that the entirety of subtext to you?" Yes, in a loose sense, double meaning, sarcasm, innuendo, irony, factiousness, and much more can all have double meanings and serve as subtext in a general sense depending on the motive of the speaker. In a more restrictive sense I believe subtext provides a context which gives the subtext a more specific meaning…often one that the speaker does not want to say outright. My example of Tina and "Paradise Lost" might serve as subtext for really saying that the just laid off listener should stop looking for another job as a manager and instead start his own business in the same field. While lots of things can act as subtext, I think specific subtext should have a motive behind it that the speaker wants understood without having to state it explicitly. Think about when the heroine comes home and talks about the day to her cat. This can give the reader lots of subtext to work with without having to be told of the heroine's internal thoughts. Erica, this is DEEP! But what we all need to write the best books we possibly can. Wow I will be thinking about this for a while. Honestly, if you had asked me "what's subtext?" I'd give you a blank stare and shrug because I had no idea there was a name for it. So evoking emotion, I get. But I will quietly admit to not being jargon savvy. However, having stated that, Erica... this explains it beautifully. It makes perfect sense. And huge thank yous for explaining it so nicely! Ruthy, I'm like you, I get it right a lot of the time but I'm not sure why. Sigh. So THIS is what I've been doing all along. Good to know. Kathy, I feel you! Sometimes you know what to do, but you don't know what it's called...or that it's called anything...or that it's a thing. You just know it needs to happen in the story. Wanna know funny??? I'm sitting in the doctor's office today waiting for a cute kid and the baseball article (about Aaron Judge and Giancarlo Stanton) asks "So what is the subtext of all this???" I was so excited to see the word TWICE in one day! I would love to join you two!!!! Wish we lived closer! Um, so perhaps I should have waited until I'd had more caffeine before visiting you today, Erica. Girl, you are talking way over my blonde head this morning. Meaning I concur with everything Ruthy said (just don't tell her I said that or she'll think I always listen to her, which I don't). Seriously, while you may be talking in at a level I don't understand, this is another one of those things that I just know needs to be in a story, even if I don't know what it's called. You just gotta know what works and what doesn't. And without subtext, it doesn't. Ruthy, pass me another cup of tea and ham and egg croissant, please. Before my head explodes. On target Mindy, it's not a blonde thing, I haven't been blonde for years. Thanks, Kathy. It's good to know that I'm not the only one. This is so good, Erica. As a newbie novelist, I'll ask you authors who have done this many times before: does the subtext flow naturally for you in a first-draft, or is it something that you tweak and add as your revising follows? Maybe it's different each time or maybe it gets easier the more you do it? I'm just curious. Glynis, I think it depends upon the style of writer you are. Does your voice naturally lend itself to subtext? Some writers layer it in as they go, some write bare bones and then go back and add subtext. Some authors keep the subtext to a minimum because they are writing a plot-first action-packed page turner...Everybody's process is different, everybody's voice is different. You both answered the question perfectly. I imagine that it is unique for each author. Thanks! 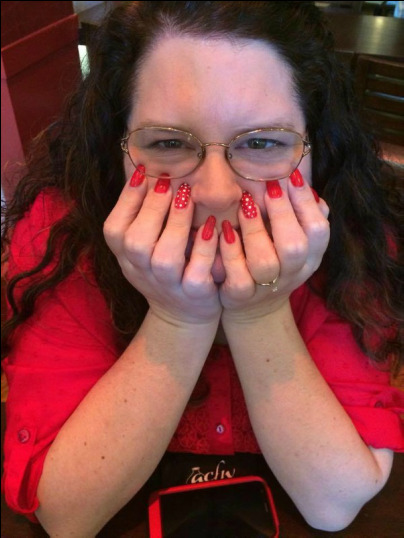 And thanks, Erica, for reminding me of Elizabeth Peters. I haven't read those books since I was in high school, but I devoured them back then. She's brilliant. I agree with Ruthy. It sometimes takes a few drafts, even for a plotter like me. In my current WIP, the one I'm actually writing instead of rewriting or editing, Jillian comes home to Hilltop with her life in ruins. Paul was her protector when they were both growing up, she was poor and had an alcoholic father, but Jill hurt Paul deeply and then left town. When she comes back he falls into the protector role again, half resentfully, though the reader knows it's because he still loves her. And she half-resents his championing her among the locals, because the reader knows she Still Loves Him and doesn't want to be beholden. But in the climax she saves Paul's daughters and a group of town children from a madman, and Paul realizes she can protect as well as be protected. Still layering in, but it's a subtext I didn't realize I had until I finished a draft. Sometimes I even amaze myself. Not often, but sometimes. Erica, I am going to put this in my (bulging) keeper file. Went away on my Winter Weekend, did line editing on two different stories while my husband was in the conference sessions and also read a chunk of Jan's book., Able to really concentrate on stuff. Today my husband is undergoing a minor procedure and I am in the hospital cafeteria on my laptop. Kathy, praying all goes well for your husband! Prayers for your husband, KB! subtext.......I wonder if I have that? This is a challenging post. Most of my writing, well, I just HOPE all I need is there. I should probably try and learn how to write. This post will help me in that regard. LOL, pretty sure you're doing okay in the subtext area. Every time one of your heroes is bemused or befuddled by a girl but likes her anyway, you're nailing the subtext! lol! And now I know the name of that elusive thing that generally makes or breaks a book for me. Thank you! I'm far more likely to set aside a book that doesn't respect my intelligence as a reader than, say, a boring first couple chapters. A boring plot can become exciting at the turn of a page, but subtext seems to have more to do with an author's writing style, and it just isn't likely they're going to change up their style mid-book. Rachael! Excellent points! Subtext is a lot about an author's style/voice. I'll give it a couple off chapters, but if my emotions and intelligence aren't engaged...I want to get out! There are some writers who do force the subtext, trying to be 'literary', or as my dad would say, 'high-falutin' and pretentious. It has to engage the emotions, or it's just a dry exercise. MJSH, it might well be! :) The wonderful, amazing thing to me is how one book can resonate with someone, and for another person, it's just flat...because of the subtext...one connects with a story because of their perceptions or personal history, and another might not. Perhaps subtext is one reason that romances are so popular...because the subtext of love, romance, and fear of not finding love or not being loved is a universal set of emotions. Erica, what a challenging post and discussion! As an English teacher, I enjoy teaching my students to recognize subtext and analyze how it affects a story. As a writer, I strive to create subtext. It's a challenge, especially since I teach on the very literary end of fiction and see the huge gap between what I teach and what I am capable of writing. Thank you for a thought-provoking post! How do your students feel when you ask them to analyze a story for subtext or theme or other literary devices? Does it enhance the story for them when they can recognize the elements that made it? Great post. A save to Pinterest post. A print-it-out-and-highlight-it post. Can you tell I loved it? 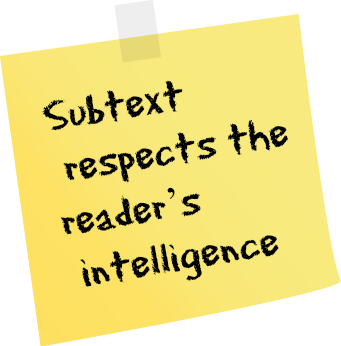 Subtext is one of those elements that takes time and care to layer into your writing. It also takes a knowledge of your story, where it's going and what the theme is. It's one of those things that I often find that I've included subconsciously. If I see it during revisions, I can capitalize on it - expand it, or include it in other parts of the story. Most often, though, I miss it until I've let the story sit for a few weeks - which often means I don't see it until I'm working on my editor's revision notes. You're so right that letting a story sit for awhile is a great way to come back to it and see what you didn't see before...both what the story has and what it lacks! I love the term 'capitalize on it!' That's exactly what we should do with subtext! Great blog post, Erica! I was thinking about Murder on the Orient Express as I read your post. So much subtext in that movie (I’ve never read the book, but I imagine it’s the same way). Lots to think about! I will look into that Elizabeth Peters book. Hi Ericka! Great post! Thanks for sharing! Thank you, Erica, for simplifying the complicated! Hi, Linda! Sometimes it's hard to put into words that 'it' factor a story has or doesn't have, isn't it? Great post! Such a good topic. One of those elements of craft that seems obvious AFTER someone points it out :-) Good job pointing it out. And even if it's something you include intuitively, it's still nice to have the vocabulary for it when you're in the editing stages. Hi, Jenna! I agree! When the light bulb went on for me about what subtext was, I was able to better utilize it, even though I had put it in my work before that time. Honing a skill is one of the exciting parts of being a writer, isn't it? Erica, this is such a great, meaty post! I love your explanations and agree with everything you said. I LOVE when I (as a reader) get the subtext of a story without it being forced on me. Makes me feel smart as a reader. LOL So it's a great reminder to trust your reader. To be subtle. One more thing I meant to say. I was particularly interested in macro subtext. I don't tend to think of that when I'm planning or writing. I tend to think of things characters are saying or not saying. Or I think of symbolism of a small item (a gift or something). But I'd really like to try thinking more, next time, of the macro things like setting. Thanks, Erica! Great post, Erica! Are you a teacher at heart? I think you are. Thanks for sharing your expertise on subtext. It's an interesting topic and a literary device that can be difficult to work into our stories. As someone mentioned, often it comes in a later draft after we have our story framework written. Of course, I'm thinking of someone who writes a fast first draft and then goes back to layer. As you said, a very clean, first-draft writer might layer as they go. I have a B.S. in education...History education specifically. And I taught High School and Jr. High History for awhile before bringing my own kidlets home to homeschool. Erica, subtext can be so tricky to write! I like how you explained the different types of subtext and the points that you made. This is an area I need to work on. I hadn't thought about macrosubtext before. This is something I want to be more intentional about as I'm writing my first draft. Hey, Jeanne! I need to be more intentional about using macro-subtext. I think if it's done with subtlety, it can be so effective! 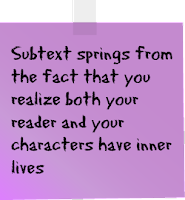 Subtext is so hard to write and to do right, but you explained it phenomenally! Thanks! Hey, Nicki! I'm glad you found the post helpful! I'm hoping subtext is part of what deepens POV. A look, a feel...things that say more than words--those are what I want to shoot for. Some days I can barely get the real text right without nailing the 'in between the lines' stuff! Subtext definitely deepens the POV. Because it's secret often, something only known to the POV character and then to the reader. Things that say more than words is spot on! Great post but a lot to ponder! Thanks for sharing!! Hi, Connie! Thanks for popping in! Thank you for making this concept so clear. Your explanations really helped me to understand what subtext really is. This post is a keeper!